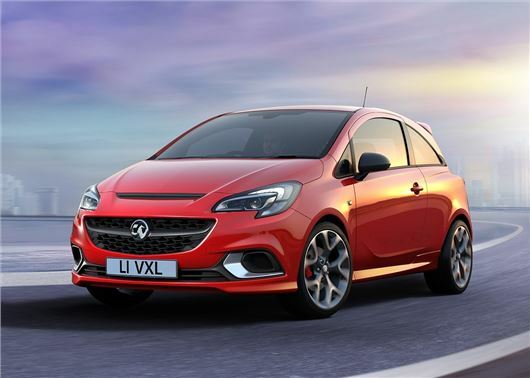 Vauxhall is renewing its hot hatch credentials with the relaunch of the Corsa GSi. The three-door hatch will use the same suspension and brakes as the Corsa VXR and cost in the region of £18,000 when it reaches showrooms in the autumn. There are no official details on engines, prices or performance; however, the Corsa GSi will take key chassis and design elements from the existing VXR model. It'll also use the three-door bodystyle and fit behind the VXR in the Corsa line-up, with prices most-likely starting in the region of £18,000. Riding on 18-inch alloy wheels, the Corsa GSi takes its suspension and brakes – with red-painted calipers - from the 210PS Corsa VXR. However, while the firmer springs and competition-tuned dampers should provide hot hatch handling, Vauxhall is promising 40+mpg with the powertrain most-likely to be an updated version of the existing 1.4-litre petrol. Inside, the Corsa GSi gets leather Recaro seats, touchscreen navigation and DAB audio. It'll also come equipped with Vauxhall’s IntelliLink infotainment system, offering Apple CarPlay and Android Auto connectivity. While the classic Vauxhall Nova spawned a 1.6 GTE performance model, it wasn’t until the launch of the original Corsa in 1993 that the GSi moniker was used – but only for a very short period. Powered by a 16-valve, double-overhead cam 1.6-litre petrol engine producing 105PS, the GSi was more lukewarm than hot hatch, with the 0-62mph sprint taking almost 10 seconds. Shame that Vauxhall is no longer a Vauxhall, despite reassurances that it’s been ‘a brand since 1903’. That’s all it is now and I presume this will have some form of Peugeot/Citroen engine. Some people love to diss Vauxhalls but I’ve had some excellent examples, my favourite being a 1983 Carlton estate. Lovely car in which we covered 93,000 miles before moving it on.